This Museum Display Cabinet is Shipment Ready From our Stocked Warehouse. 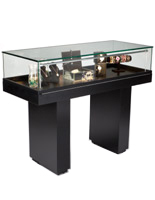 This Display Case, Curio Cabinet is a glass showcase. 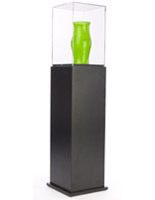 Order a Museum Display Cabinet for Your Business By 1pm EST for Same-Day Shipping! 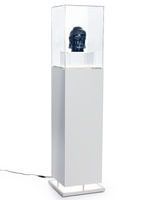 Museum Display Cabinet is Ideal for Art Gallery, Library, Museum, and Trade Show Use! 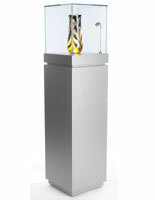 This is a glass top pedestal stand, museum display cabinet that can be used at a graphics gallery, library, museum or tradeshow to display all types of artifacts! Featured items can be swapped out quickly and effortlessly by any authorized person. A custom trade show museum display cabinet, like this attractive display tower, can be positioned near an informative graphics banner, literature stand or digital photo library to provide guests and attendees with additional information on the display item! This cabinet is a smart investment for any company, local business, or tradeshow exhibitor shopping for a unit where the construction, design and sophisticated finish will never go out of style and blends well in any setting! This museum display cabinet that can be used to display a vintage photo collection is eye-catching and can assist in increasing awareness and sales of featured merchandise! This museum display cabinet that is carefully packed in a custom wooden crate for safe shipping is heavy, weighing 138 lbs. before removing any packing materials! 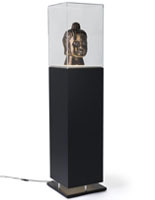 When the protective container is detached, this eye-catching glass showcase measures 15-3/4"w x 63-11/16"h x 15-3/4"d and will weigh 98 lbs! The museum display cabinet featured on this page is eye-catching and will most certainly transform the environment of any museum, gallery, library or trade show booth! 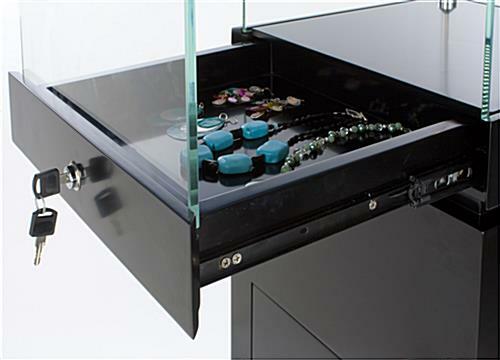 This stand has a sliding drawer and movable shelf inside the base, both of which lock securely with the included set of keys. These added components accommodate business cards, company brochures, excess merchandise and other essential materials or tools! 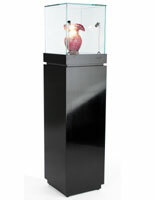 The clear tempered glass casing enables viewers to examine the showcase from all angles! This retail display stand, museum display cabinet has (2) warm colored LED lights that can tilt to highlight specific features of the photo frame or item put on view! These light fixtures are strategically positioned in the (2) front corners of the display in order to accentuate the piece of merchandise perfectly. 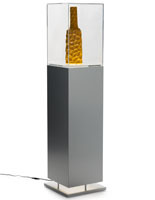 This quality glass tower, museum display cabinet is UV glued. This light curing technique is used to strongly bond and seal together two parts, an optimum choice for this heavy trade show cabinet!